JINGSHAN, Hubei Province: A man who served 11 years in prison after being wrongly convicted of murdering his wife was officially cleared yesterday. She Xianglin, 39, walked free following the pronouncement of the Jingshan County People's Court, the same body which in 1998 sentenced him to a 15-year jail term. He was informed by the court of the right to apply for state compensation. The miscarriage of justice came to light when She's wife, Zhang Zaiyu, the supposed victim of She's "crime," resurfaced late last month after being missing for 11 years. More than 2,000 local residents cheered and applauded yesterday as the man convicted of killing her walked free from court. She's wife disappeared in January 1994 from Yanmenkou Township of Jingshan County in Central China's Hubei Province. Three months later, a female body was found in a pond in the township and relatives of the missing woman identified it as Zhang. Local police charged She with murdering his wife. He was arrested in April 1994 and had been in custody ever since. However, Zhang reappeared late last month and was identified through DNA testing. Zhang had remarried in East China's Shandong Province and lived there since her disappearance in 1994. Despite spending a decade behind bars for a non-existent crime, the newly freed She was not bitter. "There is justice in the world in fact," he said after the official judgment was announced in court yesterday. 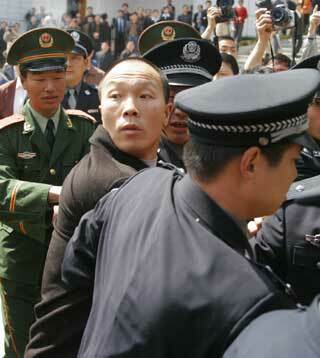 "I always believe the law is just even if I was wrongly jailed for so long," he told the China Daily. "Policemen and other law enforcers made errors, it was not a problem with the law itself," said the 39-year-old, who last tasted freedom when he was 28. The original conviction came based on a confession which She says was extracted under police torture. "I believe the law will punish them and offer me a just result," he added. A spokesman for the Jingmen government, which administrates over Jingshan County, said yesterday that investigations into those responsible for the miscarriage of justice were already underway. "The Hubei provincial government sent a joint team consisting of the provincial department of public security, procuratorate and the high people's court to dig into the case," he said yesterday. "No result or decision has been reached in apportioning blame or punishing those responsible for this travesty," he added. Zhang Chengmao, She's lawyer, said yesterday he would seek State compensation at the Jingmen Intermediate People's Court. "But we have not reached a compensation figure yet," he added. When asked about the prospect of compensation, She said however large any payment might be there were some things money could not buy. "My mother, who died from the stress of continuously appealing, cannot be bought. Eleven years of freedom cannot be bought. Schooling of my daughter which was stopped because of poverty cannot be bought," he said. As for his former wife, the man said he did not hate her at all. "If she had not reappeared, maybe I would have been wronged for life," he said. He also said he did not plan to sue Zhang for bigamy. Zhang remarried in Shandong without divorcing She. Pan Shuiguan, a 70-year-old man who waited for the judgment at the gate of the court, said: "Those who wronged She should be punished."